OK, I admit it, I've been getting a bit overambitious and carefree about my hill selection recently. So inevitably something was going to happen to put me in my place. 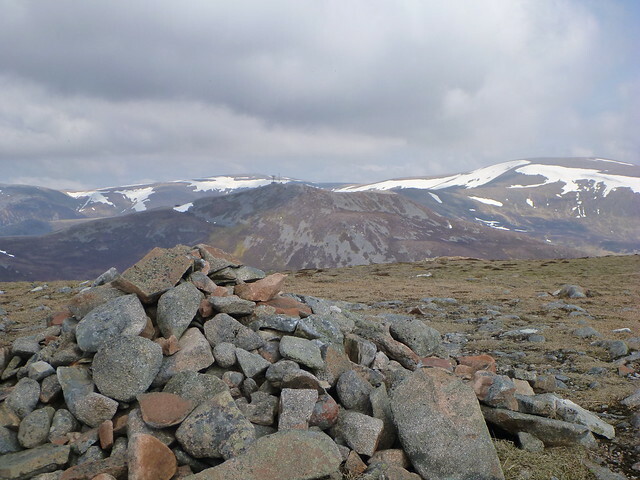 And this weekend it was the Cairnwell hills that did that, with a bit of help from the weather on saturday. We set off at 5am with a bit of intermittent drizzle but heading up to Perth the weather looked better than forecast. Could the forecasters be wrong again? 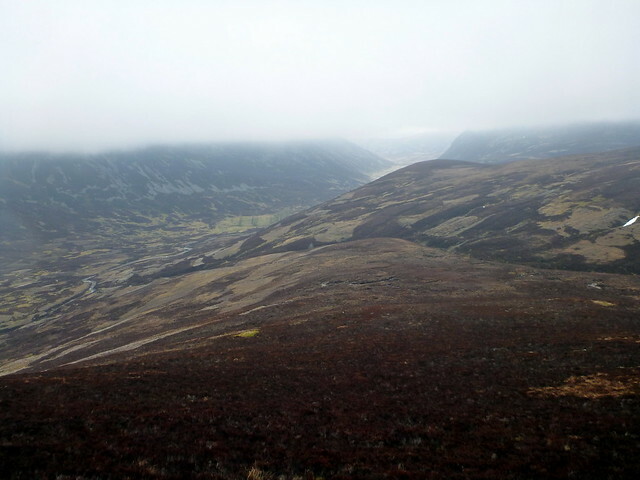 However, by the time we got nearer Glenshee and our altitude increased it was clear that we were going to be in for a challenging day's walking. I spotted a walker hitching at the bottom of the long pull up the pass - having walked that way myself from Creag Leacach I knew it was a bummer and stopped to give him a lift to the Ski Centre. He looked a little crazed, having narrowly survived a night's camping and was bewildered when I told him we were off to do the same. "In this??" he exclaimed. 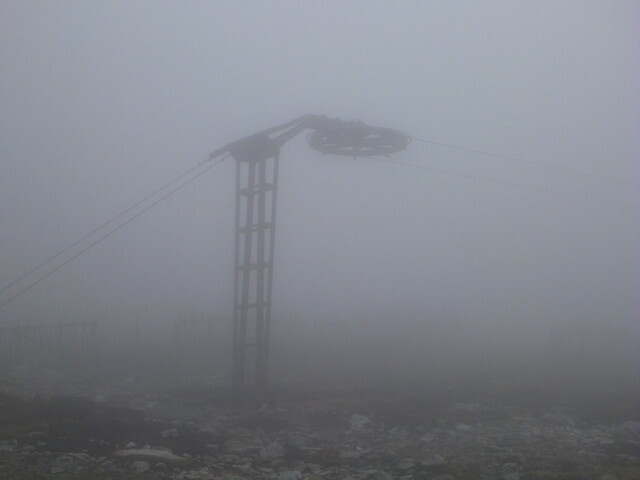 "In this" was now poor visibility due to clag and much higher winds than we'd been expecting this early in the day. 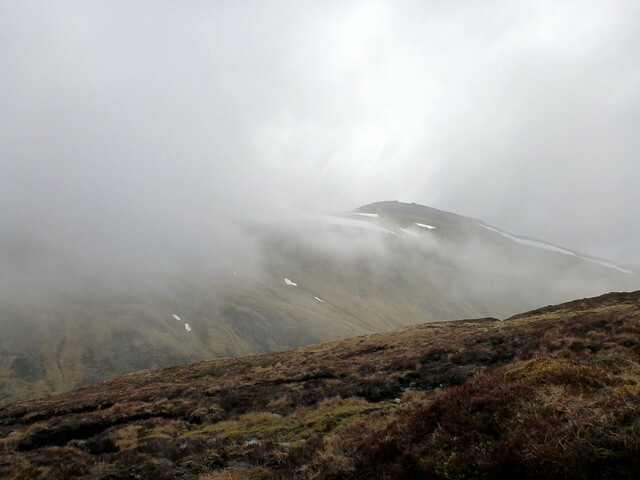 However, we assured him that this was business as normal for us at the weekend and headed off up in the general direction of Cairn Aosda in the mist. He meanwhile was hoping the cafe was going to open so he could get a warm drink, but was told by the postman that it opened "next week". Probably not a lot of use, that. 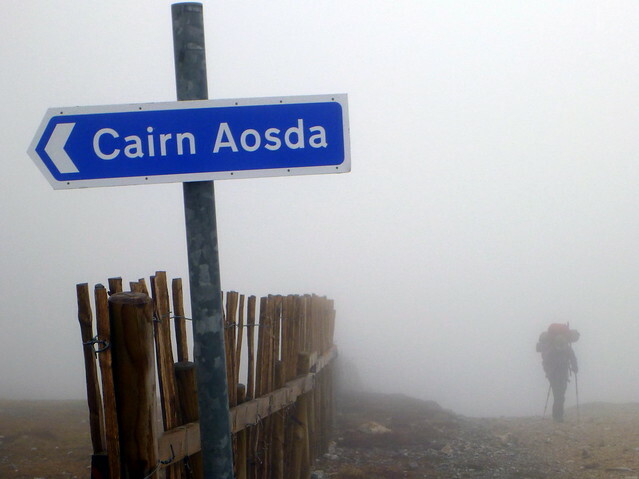 We endured the "onerous" climb up the path to Cairn Aosda, past the sad sight of redundant ski machinery and sorry looking slopes with a sliver of snow here and there, then past the sign for the hill itself and summited in under half an hour. 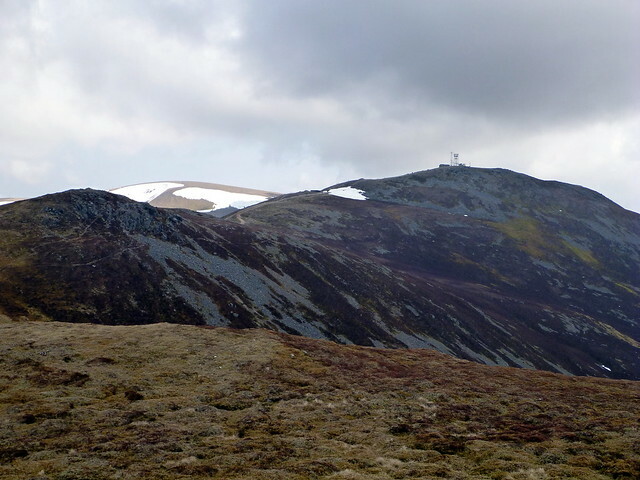 Some of that time was spent in looking for the summit cairn, which we'd managed to walk past in the clag. This was doing nothing to dispel my views of the circuit being a somewhat tiresome wheeze. 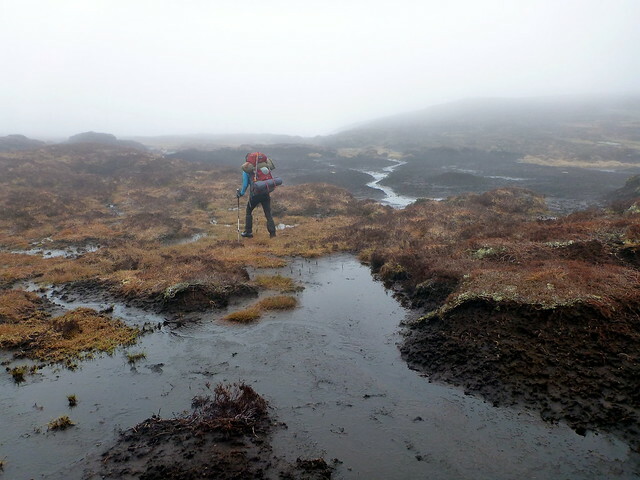 Next it was off downhill to the delights of An Socach, taking us by the almost invisible shores of Loch Vrotachan and across wet and boggy terrain. 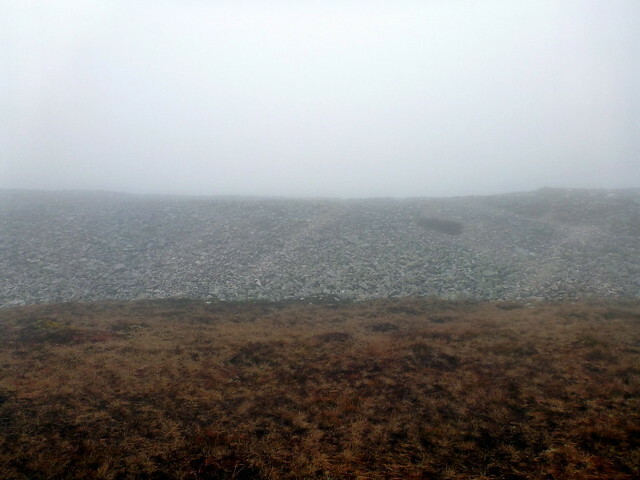 We wandered down the slopes of Sron nam Fiadh and were pleased to see that the clag was sitting at around 650m, meaning that we had visibility below this. We made out the Baddoch Burn and headed to cross this - couln't see any fords and the river level was fairly high with fast flowing water. A bit of balancing on rocks got me over, but Allison ended up having a wee paddle However, good boots, gaiters and sealskinz socks prevented webbed feet developing. Next we climbed up the grassy sides of Socach Mor until we reached the steeper stony shoulder of An Socach herself - a path was clearly evident heading up the side of the hill and I started to enjoy being out. The weather was being kind so far, only the odd burst of drizzle and relatively warm. However, this was to change when we got onto the lengthy boulder-strewn plateau that reaches to the summit of An Socach after a couple of kilometers. Oh my! - the wind was blowing fiercely across us and footing was quite difficult on sharp edged rocks and stones. Once I slipped, sending my walking pole into Allison's legs and resulting in her toppling over to a painful landing on her leg. Although no more damage than bruising was done, it did make me think how easy it is for a slip up to have major consequences out here. 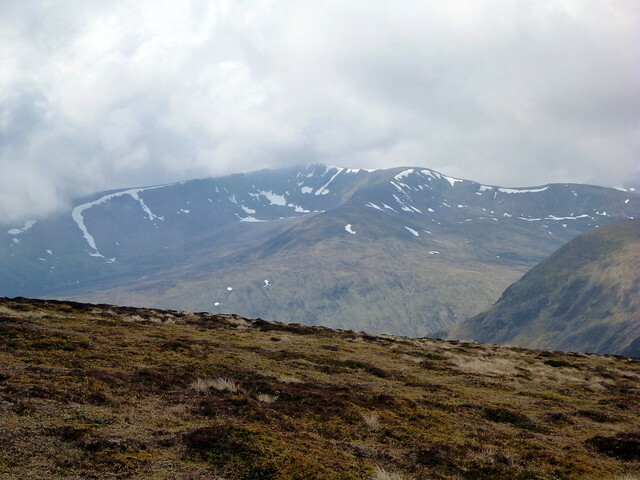 As we neared the cairn, we dropped to the south of the ridge line and entered an area of almost wind free balmy air. This would do for a lunch spot. We went to find the summit first of all then returned to our resting place out of the wind for some welcoming food and coffee. It was time to head North now, over the bouldery plains of Socach and descending, steeply in places towards the Ey Burn. Over to our right we could make out the trees around the ruined Altanour lodge. The crossig here was over narrow but fast flowing water in a steep sided ravine - this time Allison toppled backwards after crossing on tired legs and ended up with bum and rucksack bottom submerged, something like a toppled turtle This didn't go down very well, especially the water having run up her sleeves when she raised her arms to get out. 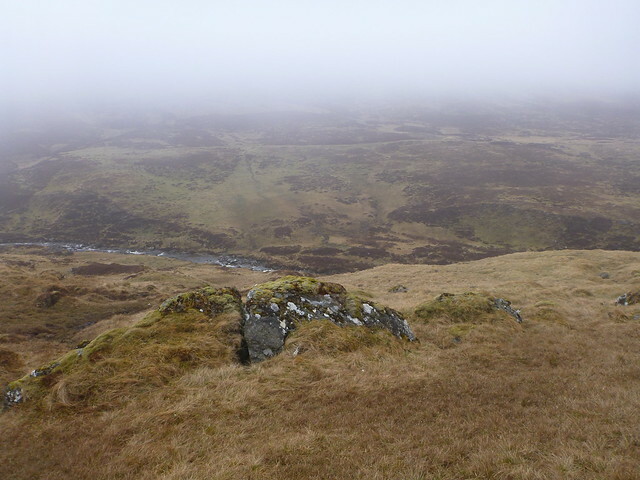 It had started to rain consistently now as we headed up the misty wet slopes towards our third hill of the day, Carn Bhac. 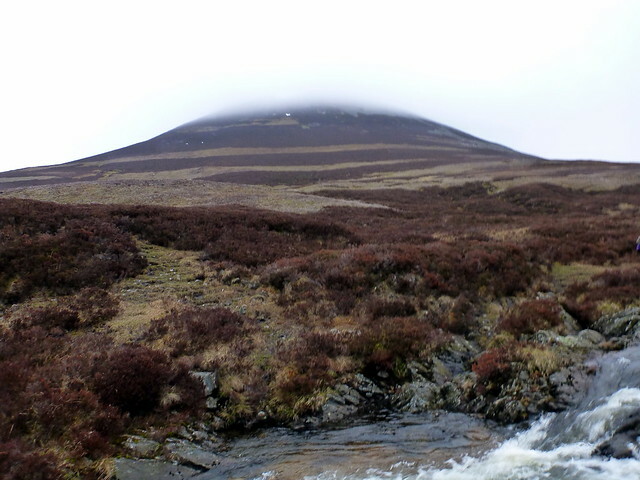 We were faced with hulking great peat hags and frequent detours to avoid these - which resulted in our time dropping further behind my hoped for rate - by the time we got to the summit we'd been walking for almost 7 hours and still had another 3 hills to do in the day before camping. 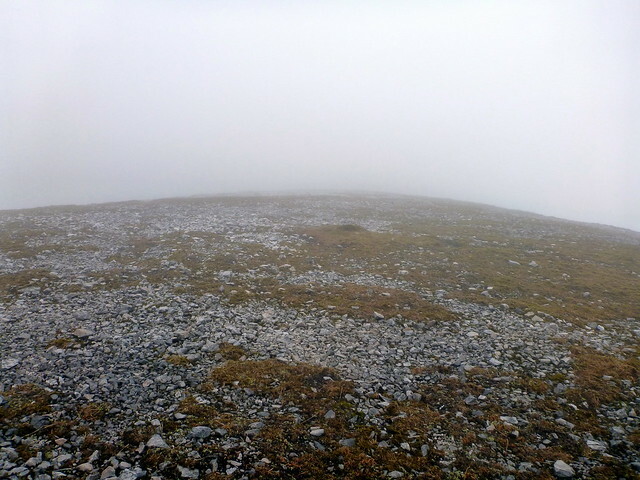 The top of Carn Bhac was unusually dressed in a piled up layer of scree that appeared to have been dumped there by a disgruntled builder with an enormous truck. Clambering over these we could make out the cairn and didn't linger for long as we were getting cold and wet. The night passed with rain drumming incessantly on the tent and the odd eerie laugh of the grouse outside. 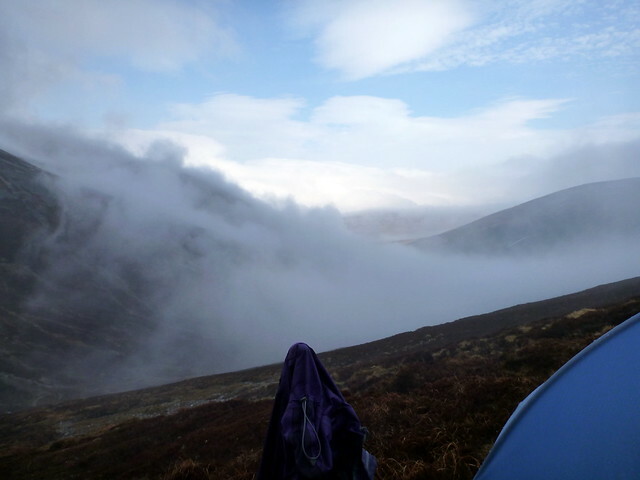 Wakening at 7, I pulled back the tent flap and saw...nothing, just total white cloud. Back to bed. By 8 there was evidence of a hill over the other side of the valley moving in and out of mist. That was better. 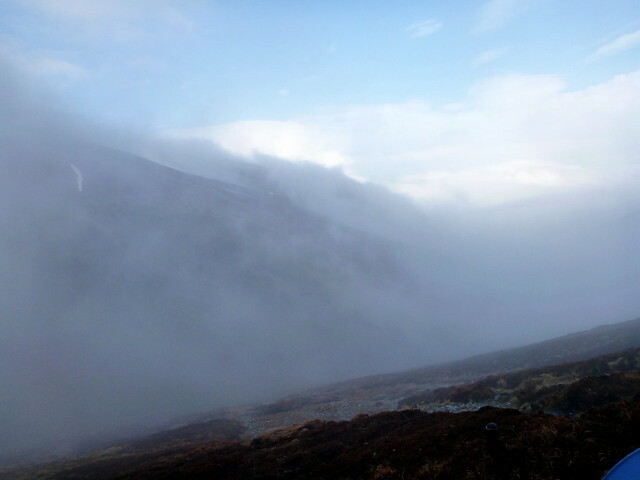 We sat and watched the mist roll along like some immense dry ice machine had been switched on. I did not like this. I don't consider myself much of a navigator by compass at the best of times and the thought of trying to find our objectives through clag wasn't a happy one. However, realistically I knew that in the worst case scenario we could just head due east and we'd eventually hit the A93 somewhere. That didn't entirely dispel the anxiety though. My inadequacies exposed, I resorted to a close study of the map - we knew our position last night and it seemed reasonably easy to get to the Loch. 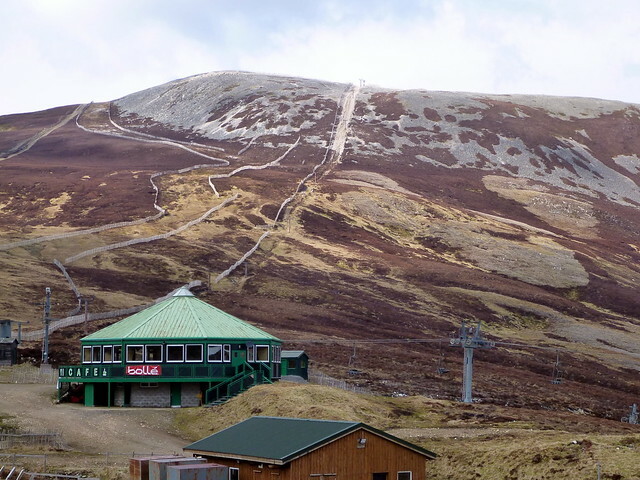 However, should we do the 2 hills nearby us or just cut our losses and do a'Gheoidh and the Cairnwell, which we had to do anyway in order to get home. 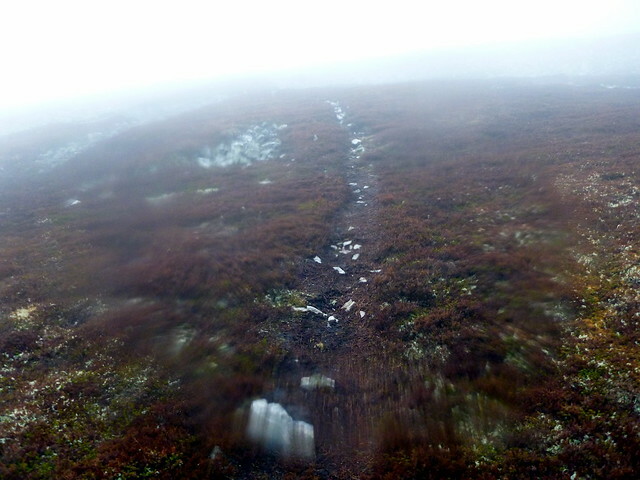 I looked over at the lower slopes of Carn an Righ and the well marked stony path that went up it before disappearing in the mist - surely it couldn't be that hard? 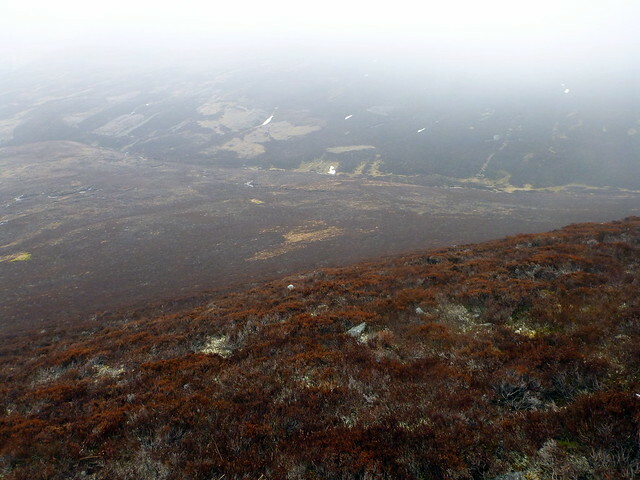 But then there was the need to find a path up Tulaichean and we might simply get lost in fog - decision made, we'd come back and do them another day, let's just see if we can get home by compas power. 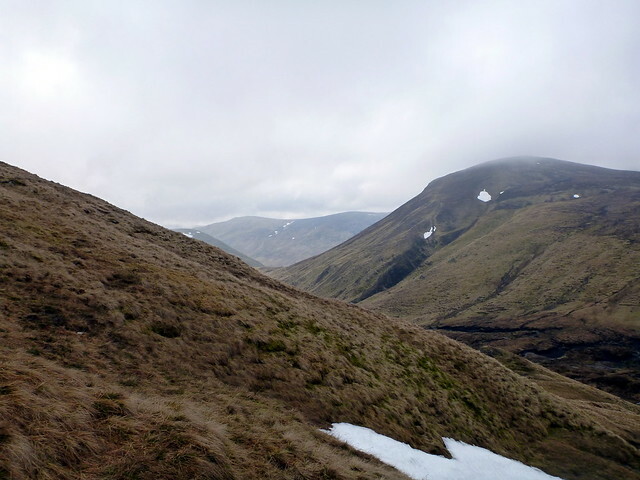 We set along the track running south of the scree slopes of Mam nan Carn towards the Loch. 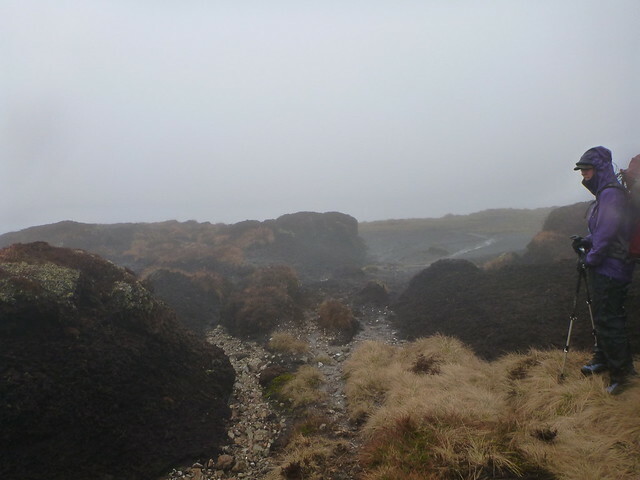 About 2.5km of bog and squelch later we were delighted to see the shores of the loch loom out of the mist. Yay, that afternoon we spent back in November practicing how to take bearings paid off! 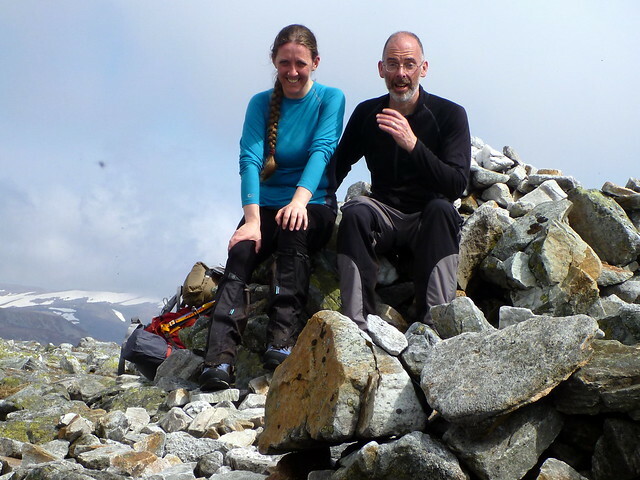 Just as quickly the excitement paled when our next bearing from where we thought we were on the lochside took us across the water if we wanted to summit Carn an Chlarsaich...oops. I've not quite managed to perfect the "walking on water" skill set yet Where we thought we were and where we were clearly 2 different things. Whilst I sat and agitated and was swarmed by several squadrons of flies, Allison set off round the loch in the mist to reccy and found that the river we'd assumed was the one on the map was nothing of the such which - she'd found the real one and the bearing now made sense. 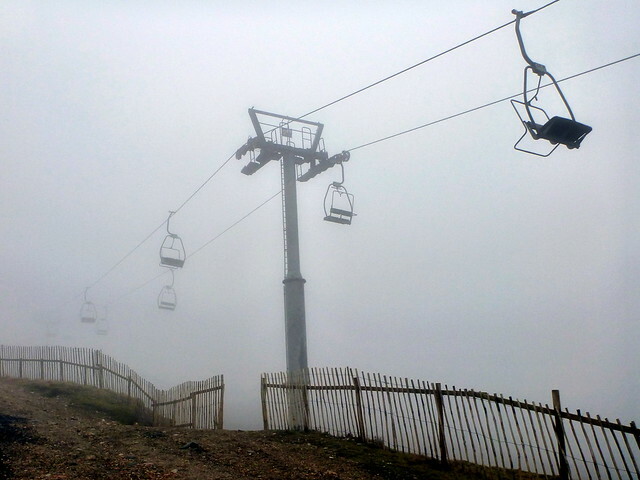 Heartened we set off up the slopes and were further lifted to see some breaks in the mist - navigating is definately easier when you can see more than 360 degree greyness! Skipping along over the bogs towards a'Gheoidh it was quite good to have to consult the map regularly and pay close attention to where you were going. Frogs leapt from underfoot and a grouse exploded out of the heather by our feet revealing a nest and clutch of eggs - we quickly headed off so that we wouldn't further disturb her. 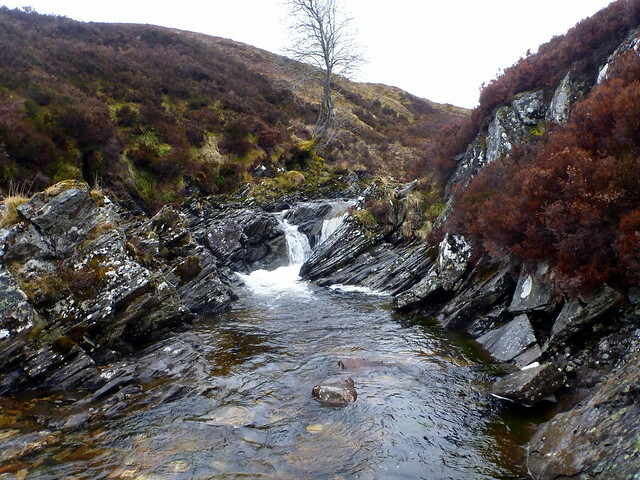 We crossed the small river Allt Elrig and began up the side of a'Gheoidh. Getting to the shoulder, I couldn't resist a trip to the accessory peak of Carn Bhinnien - we had missed out on 2 proper summits today after all. Ditching the packs, we revelled in the ease of walking without full kit on our shoulders - kit that was even heavier with all the wet clothes, tent etc inside. By this time the clag cleared significantly and we could make out something of where we were headed to the proper summit of Ca'G. The sun even came out and it was a really pleasant afternoon. We romped for the top of Carn nan Sac and decided we didn't need to set a bearing on the Cairnwell as it rose out of the landscape like some weird extraterrestrial creation, with the ironmongery on its top. Heading along the path we could look over to Carn Aosda and An Socach and actually see where we'd been yesterday now it was mist free. Wandering up the final bulldozed track to Cairnwell we met a party of walkers down from Frazerburgh to do the 3 Cairnwell hills. The first people we'd seen since the wild-eyed hitchhiker the previous morning - and on Whit weekend too! So: far from being an easy and dull trudge through uninspiring lumps, these hills had a bit of mettle. I had a really good time over the weekend despite Saturday's weather and the fact that we only bagged 6 of the 8 (or 10) hills I hoped to do. 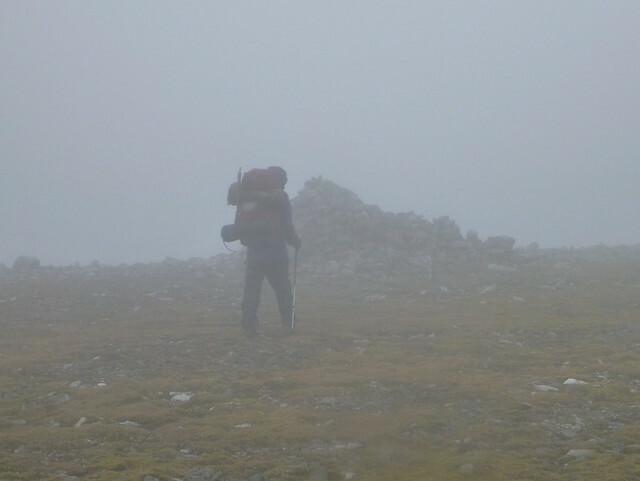 We coped with the demise of the GPS and found that our rudimentary compas skills were still of some use, although I wouldn't trust myself in thick fog wih no easy and reliable bearing points. 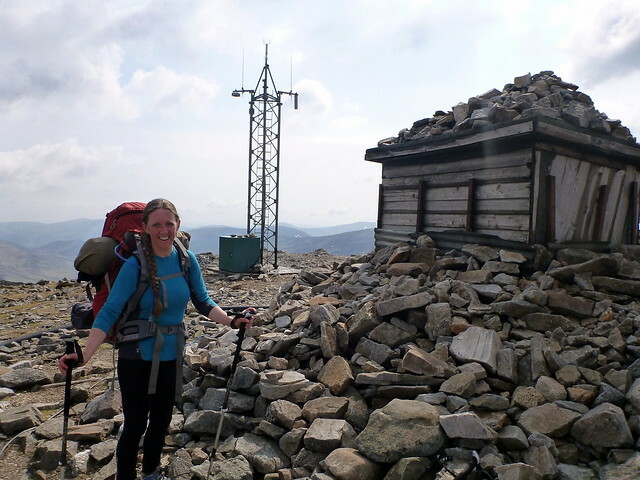 It did outline the need for practicing skills with compass and of being more realistic about the distance that can be tackled when walking with full camping kit on - 20 - 25km is enough if there are summits being done along the way. And I am not vexed about not having done all 8 hills we planned to do - even when I look at the map and see how very very close they both were to our sunday starting point - it just gives an excuse to come back to a pretty wonderful area (if you discount the manmade abominations of Aosda and Cairnwell) and make their acquaintance another day. Last edited by weaselmaster on Mon May 20, 2013 2:42 pm, edited 1 time in total. 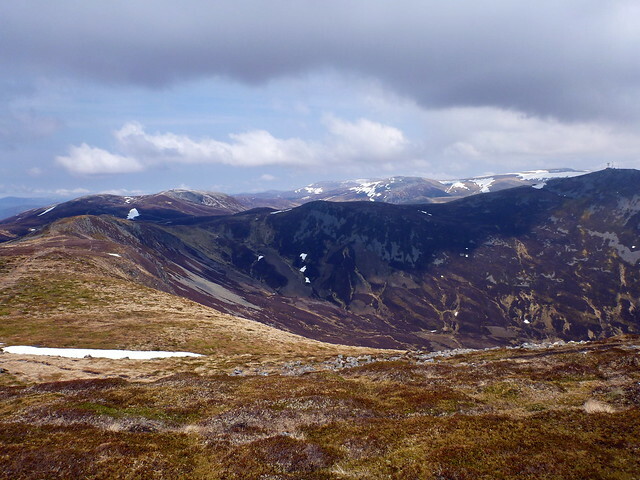 Well done with sticking with that , luckily, I was doing a course on Drystane Dyking down at Peel Farm in Angus, and even there the tent was being blown about a bit, and the rain was coming down in torrents, so it must have been worse with you up in Glenshee. Great learning process for you, but just goes to show even the wee simple ones on a good day can become something of an epic journey given the right weather conditions! Yuk! 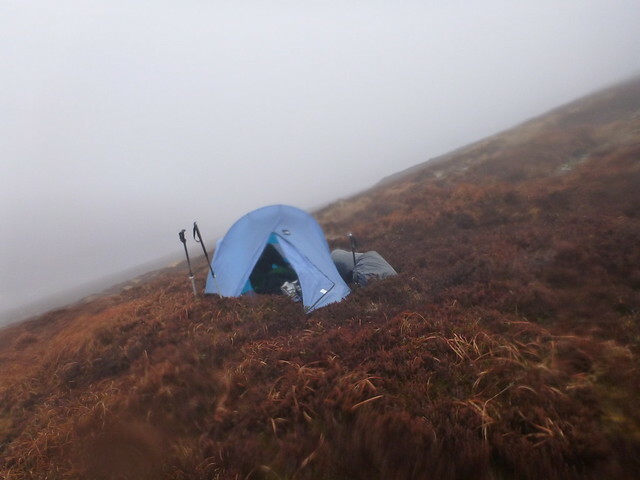 I was out a little to the west of you (around Glen Tilt and Glen Tarf), and was glad I hadn't camped out as originally planned (I went for the Tarf Hotel bothy instead). 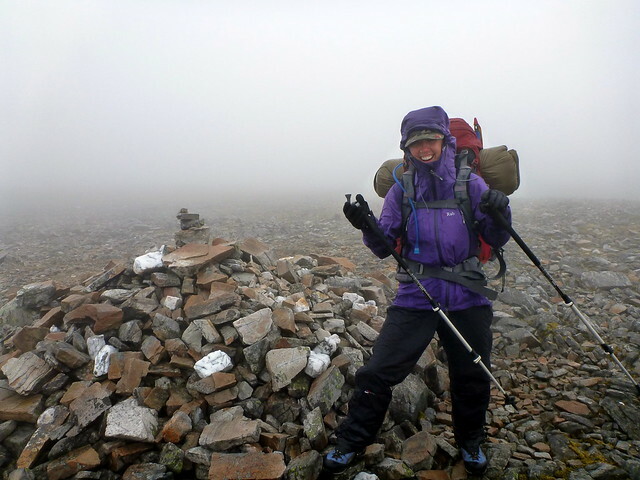 Luckily for me I set out just as you packed it in on day 1 and missed most of the rain (at 8pm there was even a bit of sunshine on Beinn a Ghlo!). Sunday was lovely once the mist cleared though. An interesting way of making some easy hills very difficult! malky_c wrote: Sunday was lovely once the mist cleared though. 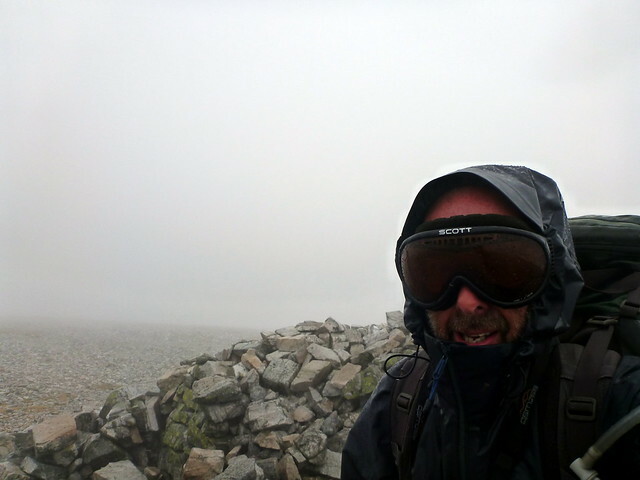 Well done for keeping going in those conditions and good to see you got sun and views on your second day. 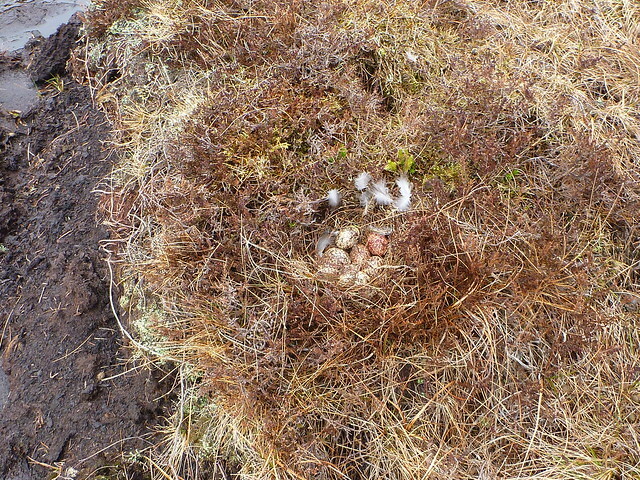 Interesting to see the grouse eggs. In all the times I've tramped across nesting areas I've only once seen eggs - think they were curlew.